With tons of bits from various sources, I derided to use this Toughest Girls of the Galaxy alternate head for one of the figures I had already put together to give some more variety to the Victoria Female Guard figure. This is the newer resin with multiple arm and weapon options. The other one I built at the same time has the AK-looking gun that I really love. Olde Quinzell got a non-Victoria head (I think it was from Maxmini, on a sprue with some other "Rasta" heads) AND some GW Mechanicus arms. I trimmed off some of the parts of the rifle to make it something different. He was tossed together with a vague idea to use him as some sort of grizzled elite Veteran character. I love scale comparison pictures because it helps me figure out about how big the minis are to something I might have or have at least seen up close in the past. With that in mind I decided to take some quick comparison shots with something other than GW Imperial Guard (plus I don't have any IG because I'm not a fan of those models). Left to right: Ikore Viridian Marine; Victoria Miniatures Male Guard; Wargames Factory Shock Trooper; Victoria Miniatures Female Guard; Ikore VASA Marine (female). Left to right:Games Workshop Imperial Army; Victoria Miniatures Male Guard; Mantic Dreadball Robot; Victoria Miniatures Female Guard; Hydra Miniatures Valkeeri (female). 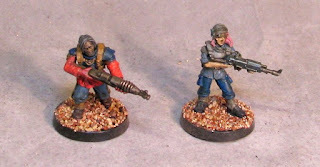 Left to right: Heresy Miniatures not-Riddick; Victoria Miniatures Male Guard; Toughest Girls of the Galaxy (female); Victoria Miniatures Female Guard; Hasslefree Miniatures Space Girl.